Mini Frittatas with Salami and Cheese, Thyme for Cooking easy gourmet. 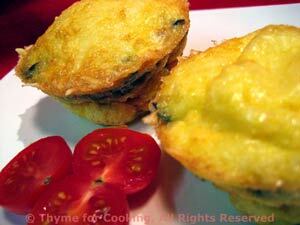 Mini Frittatas are wonderful, little egg muffins: great, warm, for a starter; great, cold for an on-the-go breakfast. They can be made with anything and everything and just need a small bit for flavor. Butter or spray a nonstick muffin (tartlet) pan - one that holds 6, or use a silicone pan (which should not need any butter). Divide salami and place in muffin cups. Snip/shred herbs and divide between cups. Using a ladle or spoon divide eggs evenly between the muffin cups. Divide cheese and sprinkle over eggs. Bake at 400F (200C) for 14 - 17 minutes or until set. Frittatas will puff up considerably and then fall when removed from oven. Allow to cool 5 - 10 minutes before removing from pan - they will start to come away from the sides of the pan as they fall making them easier to get out. Serve, garnished with a few cherry tomatoes, warm or at room temperature.